Finding the right guitar package for you is a combination of budget and features. If you want to be ready to rock the moment you unpack your instrument, but you also want to keep an eye on the bottom-line, these cheap electric guitars packages will do the trick. The first four electric guitar packages deliver you adequate quality and playability at very low prices. They may not last for years and years, but they are excellent starter packs to get your guitar life started fast and cheap. The Pyle-Pro package costs about $120. Its features include a basswood body, one volume and two-tone control knobs, three single-coil pickups, and a rosewood fretboard. It comes with a 10 watt amp that has clean and overdrive channels. Reviewers like its durability (one musician played it every day for a year, and it held up well) and its tone quality. In cases where parts were defective or damaged during shipping, the customer service took care of the problem promptly and professionally. Reviewers praise the guitar's quality design and ability to stay in tune for long periods, and the powerful presence tone of the amp. Out of 68 reviews, it has received an average rating of 4.5 stars out of 5. The Rogue Rocketeer pack costs between about $119 to about $150 if you buy it new. It has an 8.7 out of 10 star rating from 3,702 one-click ratings at Same Day Music. This Squier guitar package, made by Fender, is slightly pricier than the other options, but the quality of the materials you're getting more than makes up for it. You get the Fat Strat guitar, a Fender Bullet 150 amp with built-in effects, a stand, strap, picks, cables, bag, and strings. Reviewers rave about how the guitar had such a high quality sound, look, and playability for such a low price. The guitar is especially praised for how comfortable and easy to play it is-a great help to first-time players-and how compact and light-weight everything was. This classic Fender pack costs about $200. If you want something that has higher quality materials and design, and you don't mind a slightly higher price tag to get better value, these packs are for you. This Epiphone Les Paul Pack comes with a Les Paul-style guitar, as well as a Studio 10 amp with 3 band EQ, a stand, strap, cable, and a carrying case. New to the guitar? Don't worry because this package also comes with an instructional DVD that will help you get going. This package is a great deal because not only is the price right, but it is coming from a brand name guitar players know and trust. Reviewers love how closely its sound resembles the high-end Gibson Les Paul and how powerful the amp was, even shaking a player's room when it was first tried. However, a reviewer noted you should be careful to save all the parts, papers, and packages in the pack because if you need to return anything you must send back the whole package. This pack costs about $210. Reviewers praised its classic Ibanez sound, its great looking gloss finish, and the little touches of the pack such as the whammy bar that is included. The amp will eventually need to be upgraded to a louder, better quality amp, but it is a great practice amp for someone starting out. This Ibanez electric guitar package costs about $250. Reviewers especially like the durability of the guitar and amp. A reviewer had the products for a few years and never had any problems with them. The humbucker is especially noted as having an excellent sound and reviewers liked the DVD, which is designed for beginning guitarists. This pack costs about $260. Reviewers praised the guitar's excellent sound and custom features, especially the built-in tune which is nice for beginners, and the amp was also noted to look much better than what the pictures convey and for having a superb gritty gain and nice clean for the price. One reviewer had a defective output jack and had to return it to get it serviced, but most reviews had positive experiences with this pack. This pack costs about $310. In many areas of life, whether it's rehearsing or maintaining an instrument, the musician must exercise patience and delayed gratification. However, sometimes it's just more fun to have it all at once without any hassle or wait. 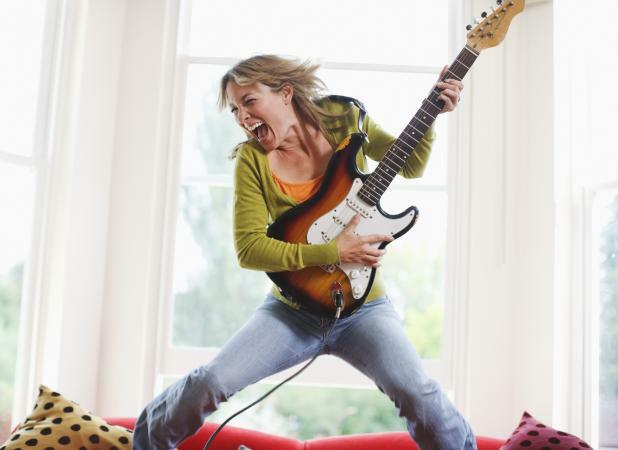 A cheap all-in-one electric guitar package can do just that.